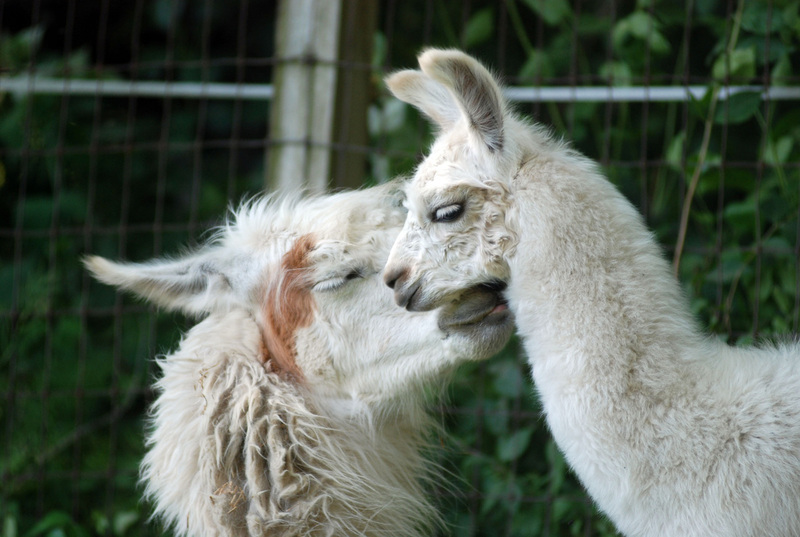 We just love the llama girls! We're so glad you've stopped by our web page to meet them and to get to know a little more about their characteristics and attributes. Annabell tugged at our heartstrings with her friendly disposition and lovely conformation. She is following in the footsteps of her parents with great prowess in the performance and halter arenas! She placed second in 2009 at the Indiana State Fair in the medium wool, yearling female class, where she was standing in a large lineup of some of the nation’s very best. At the 2010 North American International Livestock Exposition, she placed 3rd in Medium/Heavy Wool Females, 2-yr-olds. Her dam, Annie, (Macho Aces Andrew x Barcelona Mona) is an ALSA Halter and Performance Champion with well over 600 ALSA points. She was the 2001 Grand National Open Performance Champion. Annabell's half-brother is the 2010 Celebration World Futurity Champion LUA Status Quo - Silky/Non-Suri Males, 16 - 24 months. Quo was also a member of the winning Get of Sire group by Star Status Symbol of Lash's Unique Animals. Annabell is bred to Mystery's Timone for a 2012 cria. Annabell is a super performance gal. She has been fun to show in the novice-level obstacle, PR and pack classes. She also is a great partner for visits to nursing homes and schools. Annabell is ILR Incentive Fund Enrolled. To see more photos of Annabell, you can visit her page in our photo album at Flickr. Llana has an incredible disposition and silky fiber with great coverage. In 2014, she won first place with a junior handler in a pack class with more than 20 entries at the Indiana State Fair. She placed in the walking fiber class out of many entries at the Kentuckiana Show in April 2009. Llana has earned her Certificate of Achievement in the ILR UAP Program for her PR work. In 2014, she completed the steps for being an ILR certified Companion Animal. In April 2011, she was shown by one of our 5-year-old students and also by Scott who was in the llama performance arena for the first time. She brought home two first places and a seventh in obstacles with Scott in a very big class! Llana comes from a strong line of proven pedigrees, which include the impressive Peruvian El Gris, El Fuerta and La Raya Peru. Llana has a wonderful temperament like her mother, Note' Bene, and silky fiber like her sire. Llana is well balanced and has superb conformation. She is now learning how to ground drive. We hope to hitch her to a cart soon, but haven't carved out the time yet. She is one of our favorite picks for visits to schools, nursing homes, and other events off the farm. To see more photos of Llana, you can visit her page in our photo album at Flickr. Velvet is a big and beautiful half Argentine. She has an exceptional attitude and is as sweet as they come. She is so laid back you can halter her in the pasture and pick up her feet – no catch pen needed. She gets her kind disposition, big bone and fabulous wool from her sire, the late Argentine Norino. Velvet works hard in our PR and off-farm visits. She had cute female cria on May 17, 2011, by MRLF Ridge Runner. Petals arrived a little early, but has blossomed into a very sweet female who is fun to work with in obstacles and has lovely fiber that sells very well for us in our Etsy shop. She is very curious and enjoys the company of humans. To see more photos of Velvet, you can visit her page in our photo album at Flickr. This is Velvet's 2011 cria, Heartsong Velvet Petals, at about one week old. She is a lovely gal, and so sweet! Heartsong is our experienced show girl. She is a great teacher in the obstacle course and is wonderful with guests on our farm who want to try leading a llama through the obstacles. She has earned her ALSA ROM (recognition of merit) in Halter, PR and Obstacle, and is a halter Champion She gave us a gorgeous cria, LUA Holiday Status "Holly," in 2008 by Star Status Symbol. Holly is also making her mark in the show ring, ranked in 2010 in the Top 10 in the ILR UAP program for Performance - Public Relations. 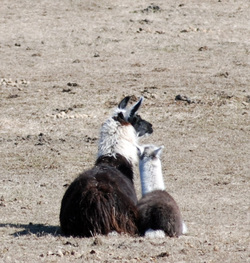 Heartsong has a gorgeous male cria in September 2012 by FFF Mas Chiri. Heartsong Patrick has been shown in halter and performance and is available in our partial herd dispersal - 2016. To see more photos of Heartsong, you can visit her page in our photo album at Flickr. 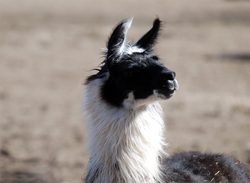 Dam: LUA Bravado's Choice "Brandy"
Betty is our light wool gal of the classic llama style. She has solid conformation and a loving disposition. She lets us halter her in the field and is wonderful with guests on the obstacle course. She proudly wears a pack and has been ranked in the Top 10 in the nation in the ILR UAP program for Beyond the Show Ring - Day Hike. Betty has twice earned Reserve Grand Champion at the Indiana State Fair in the Light Wool Female Division. In 2010, she placed first in Light/Medium Wool Females, 2-yr-olds, at the North American International Livestock Expo in Louisville, KY, and was ranked 7th of 32 entries in the championship class! In 2011, Betty and Vickie won first in a large showmanship class at the Clinton County Schooling Show. 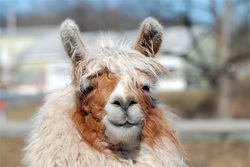 Betty is also a frequent partner for our 4-H students who lease llamas. She participated in 4-H in 2011, 2012 and 2014. In 2016, she is showing with Vickie at the end of the lead. With Vickie at the 2011 Indiana State Fair, Betty earned 1st and 2nd in the Adult Light Wool Female classes of the ALSA and ILR-SD shows. At the 2011 North American International Livestock Show and Expo, Betty earned two third places in halter and a respectful 10th place in the novice pack class that attracted many, many entries. Go Betty!! Betty's parents have 30 championships between them. To see more photos of Betty, you can visit her page in our photo album at Flickr. Stunning is a tall, gorgeous gal who could win a "Mom of the Year" award. Her sire, GVL Chilean Icon, is a past past Celebrity World Futurity Champion, and has produced a number of incredible crias. 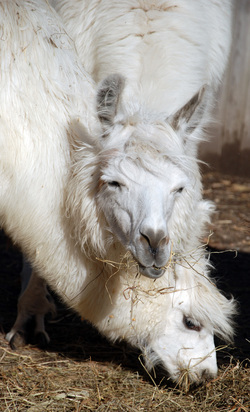 When we brought Stunning home from Hard Rock Llama Company in Ohio, she had her very handsome Campaign son at her side. His name is Hard Rock's Blanco (in photo with Stunning). We enjoyed showing Blanco in 2011 in performance, halter and fiber classes. He did great at his first training show in April 2011 and earned 7th in a very large obstacle class. He was partnered with a 4-Her for the summer and earned 1st in showmanship, 1st in PR, 1st in costume and 4th in obstacles with 6 in his division. We were really proud of him and Hannah! 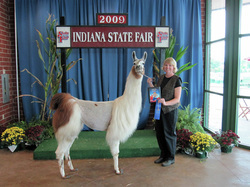 Blanco also competed in the ALSA and ILR-SD shows at the 2011 Indiana State Fair and came home with a 4th and 6th place. He is as "stunning" as his mother, Stunning! Stunning has had a beautiful female cria, May 2, 2011, by M.R.S. Fully Loaded. We named her Armful of Lilies. Fully Loaded did well in the show ring by garnering a grand championship and placing in the top ten at the LFA. He is quite correct and absolutely lovely to look at. His style is second to none. We are having fun watching Lily grow and plan to show her in 2012. She is for sale as well, so if you're looking for some interesting bloodlines to add to your herd, please contact us about Lily. To see more photos of Stunning, you can visit her page in our photo album at Flickr. To see the first steps of her 2011 female cria, visit her first video at our youtube channel. 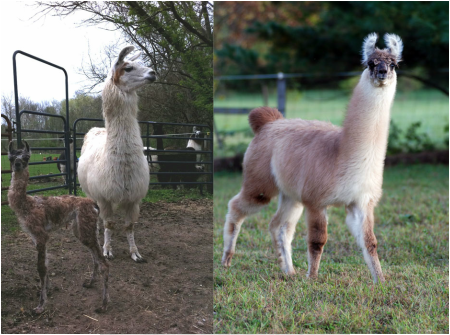 Hard Rock's Simply Stunning with her female cria who is just about 30 minutes old in the photo on the left, taken May 2, 2011. We named her Armful of Lilies. She is 5 months old in the photo on the right. I'm guessing you can tell from this photo, just how much Stunning loves her babies! Here she is in June 2012 with her son, Heartsong Gillen. He is quite a looker! He's got size, looks, presence, fiber, and conformation coming down from great genes on both sides of his pedigree. His sire is FFF Mas Chiri. We can't wait to get Gillen in the show ring! Hard Rock's Silver Fortune is the dam of our upcoming performance champion, Hard Rock's Primary Colors who is by Campaign. Colors has the sweetest, quietest disposition you can imagine. He loves to learn new obstacles and is a great partner with one of our 4-Hers. He won several ribbons at the Tippecanoe County Fair with Fiona, and then with Vickie, went to the 2011 Indiana State Fair where he was titled Grand Champion Mini Male in the ILR-SD show and Reserve Grand Champion Mini Male in the ALSA show. He also placed 10th in the novice obstacle course out of more than 50 competitors! Silver Fortune is a quiet, gal who is easy to have on the farm. She is very shy, quite attentive to her baby, and has a lovely coverage of incredibly soft, silver fiber. We have had her bred to M.R.S. 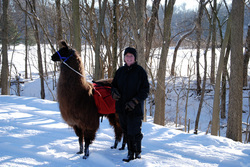 Alberta Gold from Hard Rock LLama Company in Ohio, so she is expecting a cria in September 2012. Alberta Gold is an incredibly handsome, easy-to-handle suri. 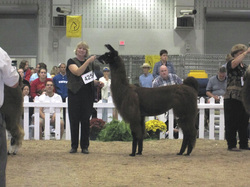 Several of his offspring at Hard Rock Llama Company have already done extremely well in the show ring. Silver Fortune would add some championship bloodlines to your herd. To see more photos of Silver Fortune, you can visit her page in our photo album at Flickr.